Dofetilide capsules contain the following inactive ingredients: microcrystalline cellulose, corn starch, colloidal silicon dioxide and magnesium stearate. The capsule shells contain gelatin, titanium dioxide, red iron oxide, yellow iron oxide, and black ink. The imprint ink contains iron oxide black, shellac, ethanol, n-butyl alcohol, isopropyl alcohol, propylene glycol, and ammonium hydroxide. Dofetilide capsules are supplied for oral administration in three dosage strengths: 125 mcg (0.125 mg) dark caramel and white capsules, 250 mcg (0.25 mg) light orange capsules, and 500 mcg (0.5 mg) light orange and white capsules. Dofetilide capsules show Vaughan Williams Class III antiarrhythmic activity. The mechanism of action is blockade of the cardiac ion channel carrying the rapid component of the delayed rectifier potassium current, IKr. At concentrations covering several orders of magnitude, dofetilide blocks only IKr with no relevant block of the other repolarizing potassium currents (e.g., IKs, IK1). At clinically relevant concentrations, dofetilide has no effect on sodium channels (associated with Class I effect), adrenergic alpha-receptors, or adrenergic beta-receptors. Dofetilide capsules increase the monophasic action potential duration in a predictable, concentration-dependent manner, primarily due to delayed repolarization. This effect, and the related increase in effective refractory period, is observed in the atria and ventricles in both resting and paced electrophysiology studies. The increase in QT interval observed on the surface ECG is a result of prolongation of both effective and functional refractory periods in the His-Purkinje system and the ventricles. In patients, dofetilide terminates induced re-entrant tachyarrhythmias (e.g., atrial fibrillation/flutter and ventricular tachycardia) and prevents their re-induction. Dofetilide capsules do not increase the electrical energy required to convert electrically induced ventricular fibrillation, and they significantly reduce the defibrillation threshold in patients with ventricular tachycardia and ventricular fibrillation undergoing implantation of a cardioverter-defibrillator device. In hemodynamic studies, dofetilide capsules had no effect on cardiac output, cardiac index, stroke volume index, or systemic vascular resistance in patients with ventricular tachycardia, mild to moderate congestive heart failure or angina, and either normal or low left ventricular ejection fraction. There was no evidence of a negative inotropic effect related to dofetilide capsules therapy in patients with atrial fibrillation. There was no increase in heart failure in patients with significant left ventricular dysfunction (see CLINICAL STUDIES, Safety in Patients with Structural Heart Disease, DIAMOND Studies). In the overall clinical program, dofetilide capsules did not affect blood pressure. Heart rate was decreased by 4-6 bpm in studies in patients. The oral bioavailability of dofetilide is >90%, with maximal plasma concentrations occurring at about 2-3 hours in the fasted state. Oral bioavailability is unaffected by food or antacid. 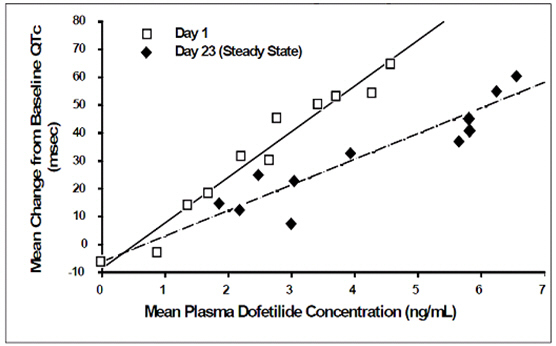 The terminal half-life of dofetilide capsules is approximately 10 hours; steady state plasma concentrations are attained within 2-3 days, with an accumulation index of 1.5 to 2.0. Plasma concentrations are dose proportional. Plasma protein binding of dofetilide is 60-70%, is independent of plasma concentration, and is unaffected by renal impairment. Volume of distribution is 3 L/kg. A population pharmacokinetic analysis showed that women have approximately 12-18% lower dofetilide oral clearances than men (14-22% greater plasma dofetilide levels), after correction for weight and creatinine clearance. In females, as in males, renal function was the single most important factor influencing dofetilide clearance. In normal female volunteers, hormone replacement therapy (a combination of conjugated estrogens and medroxyprogesterone) did not increase dofetilide exposure. Increase in QT interval is directly related to dofetilide dose and plasma concentration. Figure 1 shows that the relationship in normal volunteers between dofetilide plasma concentrations and change in QTc is linear, with a positive slope of approximately 15-25 msec/(ng/mL) after the first dose and approximately 10-15 msec/(ng/mL) at Day 23 (reflecting a steady state of dosing). A linear relationship between mean QTc increase and dofetilide dose was also seen in patients with renal impairment, in patients with ischemic heart disease, and in patients with supraventricular and ventricular arrhythmias. Note: The range of dofetilide plasma concentrations achieved with the 500 mcg BID dose adjusted for creatinine clearance is 1-3.5 ng/mL. The relationship between dose, efficacy, and the increase in QTc from baseline at steady state for the two randomized, placebo-controlled studies (described further below) is shown in Figure 2. The studies examined the effectiveness of dofetilide capsules in conversion to sinus rhythm and maintenance of normal sinus rhythm after conversion in patients with atrial fibrillation/flutter of >1 week duration. As shown, both the probability of a patient's remaining in sinus rhythm at six months and the change in QTc from baseline at steady state of dosing increased in an approximately linear fashion with increasing dose of dofetilide capsules. Note that in these studies, doses were modified by results of creatinine clearance measurement and in-hospital QTc prolongation. Number of patients evaluated for maintenance of NSR: 503 Dofetilide Capsules, 174 placebo. Number of patients evaluated for QTc change: 478 Dofetilide Capsules, 167 placebo. Two randomized, parallel, double-blind, placebo-controlled, dose-response trials evaluated the ability of dofetilide capsules 1) to convert patients with atrial fibrillation or atrial flutter (AF/AFl) of more than 1 week duration to normal sinus rhythm (NSR) and 2) to maintain NSR (delay time to recurrence of AF/AFl) after drug-induced or electrical cardioversion. A total of 996 patients with a one week to two year history of atrial fibrillation/atrial flutter were enrolled. Both studies randomized patients to placebo or to doses of dofetilide capsules 125 mcg, 250 mcg, 500 mcg, or in one study a comparator drug, given twice a day (these doses were lowered based on calculated creatinine clearance and, in one of the studies, for QT interval or QTc). All patients were started on therapy in a hospital where their ECG was monitored (see DOSAGE AND ADMINISTRATION). Acute conversion rates are shown in Table 1 for randomized doses (doses were adjusted for calculated creatinine clearance and, in Study 1, for QT interval or QTc). Of patients who converted pharmacologically, approximately 70% converted within 24-36 hours. Patients who did not convert to NSR with randomized therapy within 48-72 hours had electrical cardioversion. Those patients remaining in NSR after conversion in hospital were continued on randomized therapy as outpatients (maintenance period) for up to one year unless they experienced a recurrence of atrial fibrillation/atrial flutter or withdrew for other reasons. Table 3 and Figures 3 and 4 show, by randomized dose, the effectiveness of dofetilide capsules in maintaining NSR using Kaplan Meier analysis, which shows patients remaining on treatment. Median time to recurrence of AF/AFl could not be estimated accurately for the 250 mcg BID treatment group in Study 2 and the 500 mcg BID treatment groups in Studies 1 and 2 because dofetilide capsules maintained >50% of patients (51%, 58%, and 66%, respectively) in NSR for the 12 months duration of the studies. The point estimates of the probabilities of remaining in NSR at 6 and 12 months were 62% and 58%, respectively, for dofetilide capsules 500 mcg BID; 50% and 37%, respectively, for dofetilide capsules 250 mcg BID; and 37% and 25%, respectively, for placebo. 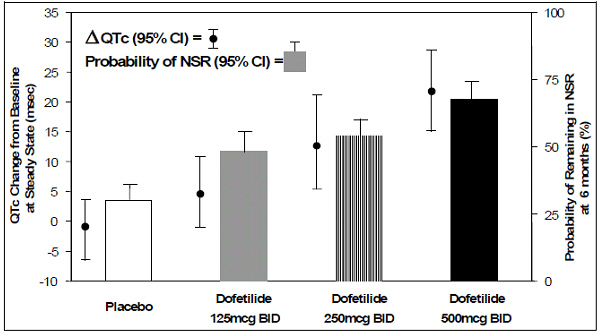 The point estimates of the probabilities of remaining in NSR at 6 and 12 months were 71% and 66%, respectively, for dofetilide capsules 500 mcg BID; 56% and 51%, respectively, for dofetilide capsules 250 mcg BID; and 26% and 21%, respectively, for placebo. In both studies, dofetilide capsules resulted in a dose-related increase in the number of patients maintained in NSR at all time periods and delayed the time of recurrence of sustained AF. Data pooled from both studies show that there is a positive relationship between the probability of staying in NSR, dofetilide capsules dose, and increase in QTc (see Figure 2 in CLINICAL PHARMACOLOGY, Dose-Response and Concentration Response for Increase in QT Interval). Analysis of pooled data for patients randomized to a dofetilide capsules dose of 500 mcg twice daily showed that maintenance of NSR was similar in both males and females, in both patients aged <65 years and patients ≥65 years of age, and in both patients with atrial flutter as a primary diagnosis and those with a primary diagnosis of atrial fibrillation. The two DIAMOND studies were 3-year trials comparing the effects of dofetilide capsules and placebo on mortality and morbidity in patients with impaired left ventricular function (ejection fraction ≤35%). Patients were treated for at least one year. One study was in patients with moderate to severe (60% NYHA Class III or IV) congestive heart failure (DIAMOND CHF) and the other was in patients with recent myocardial infarction (DIAMOND MI) (of whom 40% had NYHA Class III or IV heart failure). Both groups were at relatively high risk of sudden death. The DIAMOND trials were intended to determine whether dofetilide capsules could reduce that risk. The trials did not demonstrate a reduction in mortality; however, they provide reassurance that, when initiated carefully, in a hospital or equivalent setting, dofetilide capsules did not increase mortality in patients with structural heart disease, an important finding because other antiarrhythmics [notably the Class IC antiarrhythmics studied in the Cardiac Arrhythmia Suppression Trial (CAST) and a pure Class III antiarrhythmic, d-sotalol (SWORD)] have increased mortality in post-infarction populations. The DIAMOND trials therefore provide evidence of a method of safe use of dofetilide capsules in a population susceptible to ventricular arrhythmias. In addition, the subset of patients with AF in the DIAMOND trials provide further evidence of safety in a population of patients with structural heart disease accompanying the AF. Note, however, that this AF population was given a lower (250 mcg BID) dose (see CLINICAL STUDIES, DIAMOND Patients with Atrial Fibrillation). In both DIAMOND studies, patients were randomized to 500 mcg BID of dofetilide capsules, but this was reduced to 250 mcg BID if calculated creatinine clearance was 40–60 mL/min, if patients had AF, or if QT interval prolongation (>550 msec or >20% increase from baseline) occurred after dosing. Dose reductions for reduced calculated creatinine clearance occurred in 47% and 45% of DIAMOND CHF and MI patients, respectively. Dose reductions for increased QT interval or QTc occurred in 5% and 7% of DIAMOND CHF and MI patients, respectively. Increased QT interval or QTc (>550 msec or >20% increase from baseline) resulted in discontinuation of 1.8% of patients in DIAMOND CHF and 2.5% of patients in DIAMOND MI. DIAMOND CHF studied 1518 patients hospitalized with severe CHF who had confirmed impaired left ventricular function (ejection fraction ≤35%). Patients received a median duration of therapy of greater than one year. There were 311 deaths from all causes in patients randomized to dofetilide capsules (n=762) and 317 deaths in patients randomized to placebo (n=756). The probability of survival at one year was 73% (95% CI: 70% – 76%) in the dofetilide capsules group and 72% (95% CI: 69% – 75%) in the placebo group. Similar results were seen for cardiac deaths and arrhythmic deaths. Torsade de Pointes occurred in 25/762 patients (3.3%) receiving dofetilide capsules. The majority of cases (76%) occurred within the first 3 days of dosing. In all, 437/762 (57%) of patients on dofetilide capsules and 459/756 (61%) on placebo required hospitalization. Of these, 229/762 (30%) of patients on dofetilide capsules and 290/756 (38%) on placebo required hospitalization because of worsening heart failure. DIAMOND MI studied 1510 patients hospitalized with recent myocardial infarction (2-7 days) who had confirmed impaired left ventricular function (ejection fraction ≤35%). Patients received a median duration of therapy of greater than one year. There were 230 deaths in patients randomized to dofetilide capsules (n=749) and 243 deaths in patients randomized to placebo (n=761). The probability of survival at one year was 79% (95% CI: 76% – 82%) in the dofetilide capsules group and 77% (95% CI: 74% – 80%) in the placebo group. Cardiac and arrhythmic mortality showed a similar result. Torsade de Pointes occurred in 7/749 patients (0.9%) receiving dofetilide capsules. Of these, 4 cases occurred within the first 3 days of dosing and 3 cases occurred between Day 4 and the conclusion of the study. In all, 371/749 (50%) of patients on dofetilide capsules and 419/761 (55%) on placebo required hospitalization. Of these, 200/749 (27%) of patients on dofetilide capsules and 205/761 (27%) on placebo required hospitalization because of worsening heart failure. DIAMOND Patients with Atrial Fibrillation (the DIAMOND AF subpopulation). There were 506 patients in the two DIAMOND studies who had atrial fibrillation (AF) at entry to the studies (249 randomized to dofetilide capsules and 257 randomized to placebo). DIAMOND AF patients randomized to dofetilide capsules received 250 mcg BID; 65% of these patients had impaired renal function, so that 250 mcg BID represents the dose they would have received in the AF trials, which would give drug exposure similar to a person with normal renal function given 500 mcg BID. In the DIAMOND AF subpopulation, there were 111 deaths (45%) in the 249 patients in the dofetilide capsules group and 116 deaths (45%) in the 257 patients in the placebo group. Hospital readmission rates for any reason were 125/249 or 50% on dofetilide capsules and 156/257 or 61% for placebo. Of these, readmission rates for worsening heart failure were 73/249 or 29% on dofetilide capsules and 102/257 or 40% for placebo. Of the 506 patients in the DIAMOND studies who had atrial fibrillation or flutter at baseline, 12% of patients in the dofetilide capsules group and 2% of patients in the placebo group had converted to normal sinus rhythm after one month. In those patients converted to normal sinus rhythm, 79% of the dofetilide capsules group and 42% of the placebo group remained in normal sinus rhythm for one year. In the DIAMOND studies, although Torsade de Pointes occurred more frequently in the dofetilide capsules-treated patients (see ADVERSE REACTIONS), dofetilide capsules, given with an initial 3-day hospitalization and with dose modified for reduced creatinine clearance and increased QT interval, was not associated with an excess risk of mortality in these populations with structural heart disease in the individual studies or in an analysis of the combined studies. The presence of atrial fibrillation did not affect outcome. The concomitant use of verapamil or the cation transport system inhibitors cimetidine, trimethoprim (alone or in combination with sulfamethoxazole), or ketoconazole with dofetilide capsules is contraindicated (see WARNINGS and PRECAUTIONS, Drug-Drug Interactions), as each of these drugs cause a substantial increase in dofetilide plasma concentrations. In addition, other known inhibitors of the renal cation transport system such as prochlorperazine, dolutegravir and megestrol should not be used in patients on dofetilide capsules. The concomitant use of hydrochlorothiazide (alone or in combinations such as with triamterene) with dofetilide capsules is contraindicated (see PRECAUTIONS, Drug-Drug Interactions) because this has been shown to significantly increase dofetilide plasma concentrations and QT interval prolongation. Dofetilide capsules can cause serious ventricular arrhythmias, primarily Torsade de Pointes (TdP) type ventricular tachycardia, a polymorphic ventricular tachycardia associated with QT interval prolongation. QT interval prolongation is directly related to dofetilide plasma concentration. Factors such as reduced creatinine clearance or certain dofetilide drug interactions will increase dofetilide plasma concentration. The risk of TdP can be reduced by controlling the plasma concentration through adjustment of the initial dofetilide dose according to creatinine clearance and by monitoring the ECG for excessive increases in the QT interval. The risk of dofetilide induced ventricular arrhythmia was assessed in three ways in clinical studies: 1) by description of the QT interval and its relation to the dose and plasma concentration of dofetilide; 2) by observing the frequency of TdP in dofetilide capsules-treated patients according to dose; 3) by observing the overall mortality rate in patients with atrial fibrillation and in patients with structural heart disease. The QT interval increases linearly with increasing dofetilide capsules dose (see Figures 1 and 2 in CLINICAL PHARMACOLOGY and Dose-Response and Concentration Response for Increase in QT Interval). The majority of the episodes of TdP occurred within the first three days of dofetilide capsules therapy (10/11 events in the studies of patients with supraventricular arrhythmias; 19/25 and 4/7 events in DIAMOND CHF and DIAMOND MI, respectively; 2/4 events in the DIAMOND AF subpopulation). In a pooled survival analysis of patients in the supraventricular arrhythmia population (low prevalence of structural heart disease), deaths occurred in 0.9% (12/1346) of patients receiving dofetilide capsules and 0.4% (3/677) in the placebo group. Adjusted for duration of therapy, primary diagnosis, age, gender, and prevalence of structural heart disease, the point estimate of the hazard ratio for the pooled studies (dofetilide capsules/placebo) was 1.1 (95% CI: 0.3, 4.3). The DIAMOND CHF and MI trials examined mortality in patients with structural heart disease (ejection fraction ≤35%). In these large, double-blind studies, deaths occurred in 36% (541/1511) of dofetilide capsules patients and 37% (560/1517) of placebo patients. In an analysis of 506 DIAMOND patients with atrial fibrillation/flutter at baseline, one year mortality on dofetilide capsules was 31% vs. 32% on placebo (see CLINICAL STUDIES). Because of the small number of events, an excess mortality due to dofetilide capsules cannot be ruled out with confidence in the pooled survival analysis of placebo-controlled trials in patients with supraventricular arrhythmias. However, it is reassuring that in two large placebo-controlled mortality studies in patients with significant heart disease (DIAMOND CHF/MI), there were no more deaths in dofetilide capsules-treated patients than in patients given placebo (see CLINICAL STUDIES). Because there is a linear relationship between dofetilide plasma concentration and QTc, concomitant drugs that interfere with the metabolism or renal elimination of dofetilide may increase the risk of arrhythmia (Torsade de Pointes). Dofetilide capsules are metabolized to a small degree by the CYP3A4 isoenzyme of the cytochrome P450 system and an inhibitor of this system could increase systemic dofetilide exposure. More important, dofetilide is eliminated by cationic renal secretion, and three inhibitors of this process have been shown to increase systemic dofetilide exposure. The magnitude of the effect on renal elimination by cimetidine, trimethoprim, and ketoconazole (all contraindicated concomitant uses with dofetilide) suggests that all renal cation transport inhibitors should be contraindicated. Hypokalemia or hypomagnesemia may occur with administration of potassium-depleting diuretics, increasing the potential for Torsade de Pointes. Potassium levels should be within the normal range prior to administration of dofetilide capsules and maintained in the normal range during administration of dofetilide capsules (see DOSAGE AND ADMINISTRATION). The use of dofetilide capsules in conjunction with other drugs that prolong the QT interval has not been studied and is not recommended. Such drugs include phenothiazines, cisapride, bepridil, tricyclic antidepressants, certain oral macrolides, and certain fluoroquinolones. Class I or Class III antiarrhythmic agents should be withheld for at least three half-lives prior to dosing with dofetilide capsules. In clinical trials, dofetilide capsules were administered to patients previously treated with oral amiodarone only if serum amiodarone levels were below 0.3 mg/L or amiodarone had been withdrawn for at least three months. The overall systemic clearance of dofetilide is decreased and plasma concentration increased with decreasing creatinine clearance. The dose of dofetilide capsules must be adjusted based on creatinine clearance (see DOSAGE AND ADMINISTRATION). Patients undergoing dialysis were not included in clinical studies, and appropriate dosing recommendations for these patients are unknown. There is no information about the effectiveness of hemodialysis in removing dofetilide from plasma. After adjustment for creatinine clearance, no additional dose adjustment is required for patients with mild or moderate hepatic impairment. Patients with severe hepatic impairment have not been studied. Dofetilide capsules should be used with particular caution in these patients. Animal and human studies have not shown any adverse effects of dofetilide on conduction velocity. No effect on AV nodal conduction following dofetilide capsules treatment was noted in normal volunteers and in patients with 1st degree heart block. Patients with sick sinus syndrome or with 2nd or 3rd degree heart block were not included in the Phase 3 clinical trials unless a functioning pacemaker was present. Dofetilide capsules have been used safely in conjunction with pacemakers (53 patients in DIAMOND studies, 136 in trials in patients with ventricular and supraventricular arrhythmias). Prior to initiation of dofetilide capsules therapy, the patient should be advised to read the Medication Guide and reread it each time therapy is renewed in case the patient's status has changed. The patient should be fully instructed on the need for compliance with the recommended dosing of dofetilide capsules and the potential for drug interactions, and the need for periodic monitoring of QTc and renal function to minimize the risk of serious abnormal rhythms. Assessment of patients' medication history should include all over-the-counter, prescription, and herbal/natural preparations with emphasis on preparations that may affect the pharmacokinetics of dofetilide capsules such as cimetidine (see CONTRAINDICATIONS), trimethoprim alone or in combination with sulfamethoxazole (see WARNINGS, CONTRAINDICATIONS), prochlorperazine (see WARNINGS, CONTRAINDICATIONS), megestrol (see WARNINGS, CONTRAINDICATIONS), ketoconazole (see WARNINGS, CONTRAINDICATIONS), dolutegravir (see CONTRAINDICATIONS), hydrochlorothiazide (alone or in combinations such as with triamterene) (see CONTRAINDICATIONS), other cardiovascular drugs (especially verapamil – see CONTRAINDICATIONS), phenothiazines, and tricyclic antidepressants (see WARNINGS). If a patient is taking dofetilide capsules and requires anti-ulcer therapy, omeprazole, ranitidine, or antacids (aluminum and magnesium hydroxides) should be used as alternatives to cimetidine, as these agents have no effect on the pharmacokinetics of dofetilide capsules. Patients should be instructed to notify their health care providers of any change in over-the-counter, prescription, or supplement use. If a patient is hospitalized or is prescribed a new medication for any condition, the patient must inform the health care provider of ongoing dofetilide capsules therapy. Patients should also check with their health care provider and/or pharmacist prior to taking a new over-the-counter preparation. (see WARNINGS, CONTRAINDICATIONS) Concomitant use of cimetidine is contraindicated. Cimetidine at 400 mg BID (the usual prescription dose) co-administered with dofetilide capsules (500 mcg BID) for 7 days has been shown to increase dofetilide plasma levels by 58%. Cimetidine at doses of 100 mg BID (OTC dose) resulted in a 13% increase in dofetilide plasma levels (500 mcg single dose). No studies have been conducted at intermediate doses of cimetidine. If a patient requires dofetilide capsules and anti-ulcer therapy, it is suggested that omeprazole, ranitidine, or antacids (aluminum and magnesium hydroxides) be used as alternatives to cimetidine, as these agents have no effect on the pharmacokinetic profile of dofetilide capsules. (see CONTRAINDICATIONS) Concomitant use of verapamil is contraindicated. Co-administration of dofetilide capsules with verapamil resulted in increases in dofetilide peak plasma levels of 42%, although overall exposure to dofetilide was not significantly increased. In an analysis of the supraventricular arrhythmia and DIAMOND patient populations, the concomitant administration of verapamil with dofetilide was associated with a higher occurrence of Torsade de Pointes. (see WARNINGS, CONTRAINDICATIONS) Concomitant use of ketoconazole is contraindicated. 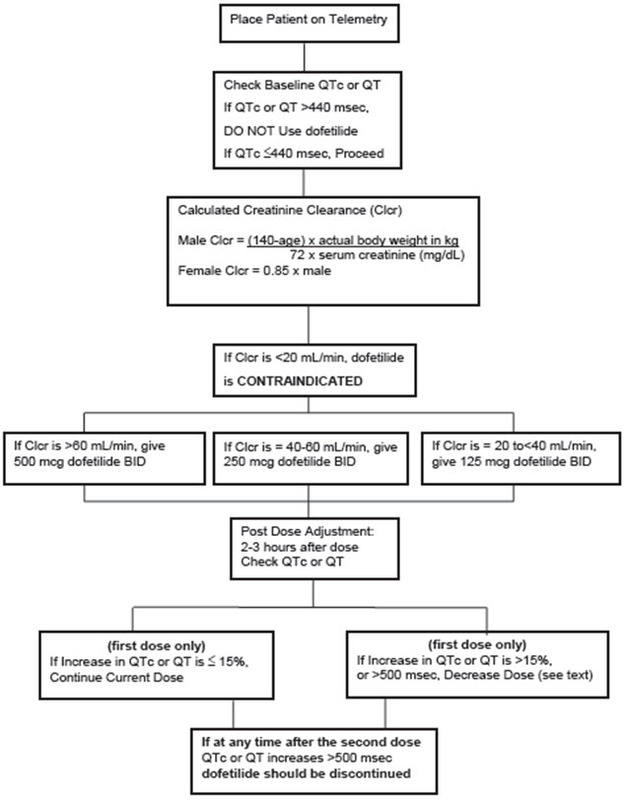 Ketoconazole at 400 mg daily (the maximum approved prescription dose) co-administered with dofetilide capsules (500 mcg BID) for 7 days has been shown to increase dofetilide Cmax by 53% in males and 97% in females, and AUC by 41% in males and 69% in females. (see WARNINGS, CONTRAINDICATIONS) Concomitant use of trimethoprim alone or in combination with sulfamethoxazole is contraindicated. Trimethoprim 160 mg in combination with 800 mg sulfamethoxazole co-administered BID with dofetilide capsules (500 mcg BID) for 4 days has been shown to increase dofetilide AUC by 103% and Cmax by 93%. (see CONTRAINDICATIONS) Concomitant use of HCTZ alone or in combination with triamterene is contraindicated. HCTZ 50 mg QD or HCTZ/triamterene 50/100 mg QD was co-administered with dofetilide capsules (500 mcg BID) for 5 days (following 2 days of diuretic use at half dose). In patients receiving HCTZ alone, dofetilide AUC increased by 27% and Cmax by 21%. However, the pharmacodynamic effect increased by 197% (QTc increase over time) and by 95% (maximum QTc increase). In patients receiving HCTZ in combination with triamterene, dofetilide AUC increased by 30% and Cmax by 16%. However, the pharmacodynamic effect increased by 190% (QTc increase over time) and by 84% (maximum QTc increase). The pharmacodynamic effects can be explained by a combination of the increase in dofetilide exposure and the reductions in serum potassium. In the DIAMOND trials, 1252 patients were treated with dofetilide capsules and diuretics concomitantly, of whom 493 died compared to 508 deaths among the 1248 patients receiving placebo and diuretics. Of the 229 patients who had potassium depleting diuretics added to their concomitant medications in the DIAMOND trials, the patients on dofetilide capsules had a non-significantly reduced relative risk for death of 0.68 (95% CI: 0.376, 1.230). Dofetilide is eliminated in the kidney by cationic secretion. Inhibitors of renal cationic secretion are contraindicated with dofetilide capsules. In addition, drugs that are actively secreted via this route (e.g., triamterene, metformin, and amiloride) should be co-administered with care as they might increase dofetilide levels. Dofetilide is metabolized to a small extent by the CYP3A4 isoenzyme of the cytochrome P450 system. Inhibitors of the CYP3A4 isoenzyme could increase systemic dofetilide exposure. Inhibitors of this isoenzyme (e.g., macrolide antibiotics, azole antifungal agents, protease inhibitors, serotonin reuptake inhibitors, amiodarone, cannabinoids, diltiazem, grapefruit juice, nefazadone, norfloxacin, quinine, zafirlukast) should be cautiously co-administered with dofetilide capsules as they can potentially increase dofetilide levels. Dofetilide is not an inhibitor of CYP3A4 nor of other cytochrome P450 isoenzymes (e.g., CYP2C9, CYP2D6) and is not expected to increase levels of drugs metabolized by CYP3A4. Studies in healthy volunteers have shown that dofetilide capsules do not affect the pharmacokinetics of digoxin. In patients, the concomitant administration of digoxin with dofetilide was associated with a higher occurrence of Torsade de Pointes. It is not clear whether this represents an interaction with dofetilide capsules or the presence of more severe structural heart disease in patients on digoxin; structural heart disease is a known risk factor for arrhythmia. No increase in mortality was observed in patients taking digoxin as concomitant medication. In healthy volunteers, amlodipine, phenytoin, glyburide, ranitidine, omeprazole, hormone replacement therapy (a combination of conjugated estrogens and medroxyprogesterone), antacid (aluminum and magnesium hydroxides), and theophylline did not affect the pharmacokinetics of dofetilide capsules. In addition, studies in healthy volunteers have shown that dofetilide capsules do not affect the pharmacokinetics or pharmacodynamics of warfarin, or the pharmacokinetics of propranolol (40 mg twice daily), phenytoin, theophylline, or oral contraceptives. Dofetilide has been shown to adversely affect in utero growth and survival of rats and mice when orally administered during organogenesis at doses of 2 or more mg/kg/day. Other than an increased incidence of non-ossified 5th metacarpal, and the occurrence of hydroureter and hydronephroses at doses as low as 1 mg/kg/day in the rat, structural anomalies associated with drug treatment were not observed in either species at doses below 2 mg/kg/day. The clearest drug-effect associations were for sternebral and vertebral anomalies in both species; cleft palate, adactyly, levocardia, dilation of cerebral ventricles, hydroureter, hydronephroses, and unossified metacarpal in the rat; and increased incidence of unossified calcaneum in the mouse. The "no observed adverse effect dose" in both species was 0.5 mg/kg/day. The mean dofetilide AUCs(0– 24hr) at this dose in the rat and mouse are estimated to be about equal to the maximum likely human AUC and about half the likely human AUC, respectively. There are no adequate and well controlled studies in pregnant women. Therefore, dofetilide should only be administered to pregnant women where the benefit to the patient justifies the potential risk to the fetus. There is no information on the presence of dofetilide in breast milk. Patients should be advised not to breastfeed an infant if they are taking dofetilide capsules. Of the total number of patients in clinical studies of dofetilide capsules, 46% were 65 to 89 years old. No overall differences in safety, effect on QTc, or effectiveness were observed between elderly and younger patients. Because elderly patients are more likely to have decreased renal function with a reduced creatinine clearance, care must be taken in dose selection (see DOSAGE AND ADMINISTRATION). Female patients constituted 32% of the patients in the placebo-controlled trials of dofetilide capsules. As with other drugs that cause Torsade de Pointes, dofetilide capsules were associated with a greater risk of Torsade de Pointes in female patients than in male patients. During the dofetilide capsules clinical development program, the risk of Torsade de Pointes in females was approximately 3 times the risk in males. Unlike Torsade de Pointes, the incidence of other ventricular arrhythmias was similar in female patients receiving dofetilide capsules and patients receiving placebo. Although no study specifically investigated this risk, in post-hoc analyses, no increased mortality was observed in females on dofetilide capsules compared to females on placebo. The safety and effectiveness of dofetilide capsules in children (<18 years old) has not been established. The dofetilide capsules clinical program involved approximately 8,600 patients in 130 clinical studies of normal volunteers and patients with supraventricular and ventricular arrhythmias. Dofetilide capsules were administered to 5,194 patients, including two large, placebo-controlled mortality trials (DIAMOND CHF and DIAMOND MI) in which 1,511 patients received dofetilide capsules for up to three years. In studies of patients with supraventricular arrhythmias, a total of 1,346 and 677 patients were exposed to dofetilide capsules and placebo for 551 and 207 patient years, respectively. A total of 8.7% of patients in the dofetilide groups were discontinued from clinical trials due to adverse events compared to 8.0% in the placebo groups. The most frequent reason for discontinuation (>1%) was ventricular tachycardia (2.0% on dofetilide vs. 1.3% on placebo). The most frequent adverse events were headache, chest pain, and dizziness. 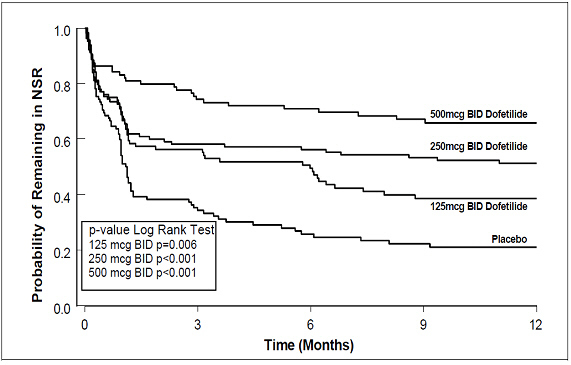 Torsade de Pointes is the only arrhythmia that showed a dose-response relationship to dofetilide capsules treatment. It did not occur in placebo treated patients. The incidence of Torsade de Pointes in patients with supraventricular arrhythmias was 0.8% (11/1346) (see WARNINGS). The incidence of Torsade de Pointes in patients who were dosed according to the recommended dosing regimen (see DOSAGE AND ADMINISTRATION) was 0.8% (4/525). 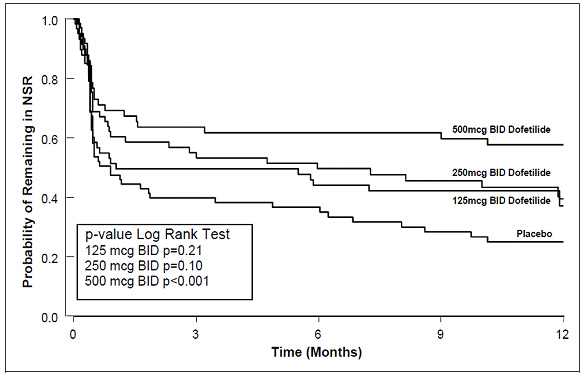 Table 6 shows the frequency by randomized dose of serious arrhythmias and conduction disturbances reported as adverse events in patients with supraventricular arrhythmias. In the DIAMOND trials, a total of 1,511 patients were exposed to dofetilide capsules for 1757 patient years. The incidence of Torsade de Pointes was 3.3% in CHF patients and 0.9% in patients with a recent MI. Table 8 presents other adverse events reported with a frequency of >2% on dofetilide capsules and reported numerically more frequently on dofetilide capsules than on placebo in the studies of patients with supraventricular arrhythmias. Adverse events reported at a rate >2% but no more frequently on dofetilide capsules than on placebo were: angina pectoris, anxiety, arthralgia, asthenia, atrial fibrillation, complications (application, injection, incision, insertion, or device), hypertension, pain, palpitation, peripheral edema, supraventricular tachycardia, sweating, urinary tract infection, ventricular tachycardia. The following adverse events have been reported with a frequency of ≤2% and numerically more frequently with dofetilide capsules than placebo in patients with supraventricular arrhythmias: angioedema, bradycardia, cerebral ischemia, cerebrovascular accident, edema, facial paralysis, flaccid paralysis, heart arrest, increased cough, liver damage, migraine, myocardial infarct, paralysis, paresthesia, sudden death, and syncope. The incidences of clinically significant laboratory test abnormalities in patients with supraventricular arrhythmias were similar for patients on dofetilide capsules and those on placebo. No clinically relevant effects were noted in serum alkaline phosphatase, serum GGT, LDH, AST, ALT, total bilirubin, total protein, blood urea nitrogen, creatinine, serum electrolytes (calcium, chloride, glucose, magnesium, potassium, sodium), or creatine kinase. Similarly, no clinically relevant effects were observed in hematologic parameters. There is no known antidote to dofetilide capsules; treatment of overdose should therefore be symptomatic and supportive. The most prominent manifestation of overdosage is likely to be excessive prolongation of the QT interval. In cases of overdose, cardiac monitoring should be initiated. Charcoal slurry may be given soon after overdosing but has been useful only when given within 15 minutes of dofetilide capsules administration. Treatment of Torsade de Pointes or overdose may include administration of isoproterenol infusion, with or without cardiac pacing. Administration of intravenous magnesium sulfate may be effective in the management of Torsade de Pointes. Close medical monitoring and supervision should continue until the QT interval returns to normal levels. Dofetilide capsules overdose was rare in clinical studies; there were two reported cases of dofetilide capsules overdose in the oral clinical program. One patient received very high multiples of the recommended dose (28 capsules), was treated with gastric aspiration 30 minutes later, and experienced no events. One patient inadvertently received two 500 mcg doses one hour apart and experienced ventricular fibrillation and cardiac arrest 2 hours after the second dose. Serum potassium should be maintained within the normal range before dofetilide capsules treatment is initiated and should be maintained within the normal range while the patient remains on dofetilide capsules therapy. (See WARNINGS, Hypokalemia and Potassium-Depleting Diuretics). In clinical trials, potassium levels were generally maintained above 3.6-4.0 mEq/L. Patients to be discharged on dofetilide capsules therapy from an inpatient setting as described above must have an adequate supply of dofetilide capsules, at the patient's individualized dose, to allow uninterrupted dosing until the patient can fill a dofetilide capsules prescription. Step 1. Electrocardiographic assessment: Prior to administration of the first dose, the QTc must be determined using an average of 5-10 beats. If the QTc is greater than 440 msec (500 msec in patients with ventricular conduction abnormalities), dofetilide capsules are contraindicated. If heart rate is less than 60 beats per minute, QT interval should be used. Patients with heart rates <50 beats per minute have not been studied. Step 6. At 2-3 hours after each subsequent dose of dofetilide capsules, determine the QTc (for in-hospital doses 2-5). No further down titration of dofetilide capsules based on QTc is recommended. The dosing algorithm shown above should be used to determine the individualized dose of dofetilide capsules. In clinical trials (see CLINICAL STUDIES), the highest dose of 500 mcg BID of dofetilide capsules as modified by the dosing algorithm led to greater effectiveness than lower doses of 125 or 250 mcg BID as modified by the dosing algorithm. The risk of Torsade de Pointes, however, is related to dose as well as to patient characteristics (see WARNINGS). Physicians, in consultation with their patients, may therefore in some cases choose doses lower than determined by the algorithm. It is critically important that if at any time this lower dose is increased, the patient needs to be rehospitalized for three days. Previous toleration of higher doses does not eliminate the need for rehospitalization. If patients do not convert to normal sinus rhythm within 24 hours of initiation of dofetilide capsules therapy, electrical conversion should be considered. Patients continuing on dofetilide capsules after successful electrical cardioversion should continue to be monitored by electrocardiography for 12 hours post cardioversion, or a minimum of 3 days after initiation of dofetilide capsules therapy, whichever is greater. Dofetilide capsules is a prescription medicine that is used to treat an irregular heartbeat (atrial fibrillation or atrial flutter). are pregnant or plan to become pregnant. It is not known if dofetilide will harm your unborn baby. are breastfeeding or plan to breastfeed. It is not known if dofetilide passes into your breast milk. You and your doctor should decide if you will take dofetilide capsules or breastfeed. You should not do both. Ask your doctor if you are not sure about the medicines you take. Tell your doctor about all prescription and non-prescription medicines, vitamins, dietary supplements, and any natural or herbal remedies. Dofetilide capsules and other medicines may affect each other, causing serious side effects. If you take dofetilide capsules with certain medicines, you will be more likely to have a different type of abnormal heartbeat. See "Who should not take Dofetilide Capsules?" If you take too much dofetilide capsules, call your doctor or go to the nearest hospital emergency room right away. Take your dofetilide capsules with you to show to the doctor. Dofetilide capsules can cause serious side effects, including a type of abnormal heartbeat called Torsade de Pointes, which can lead to death. See "What is the most important information I should know about Dofetilide Capsules?" Store dofetilide capsules between 59° to 86°F (15° to 30°C). For more about dofetilide capsules, call 1-844-825-8500.